So that was all very exciting and I was a little bit proud of myself for managing 3 markets in succession. I am very lucky to have a good baker-friend in Hemel Hempstead who very kindly lets me use his mixer, without this, I would be a total zombie, as I'd have to knead everything by hand. But it did mean that I had to hump carefully weighed out boxes of flour, salt and sourdough mixes and pre-mixes and drive them all the way to Hemel, then drive them all back again, for proving and shaping at home. So after a lot of stashing away hard earned cash, I managed to save enough to get me a second-hand mixer. New ones are prohibitively expensive and besides, these things are designed to last forever, so long as you can get the labour and parts, which I very soon found out after I'd bought one from a rogue on ebay. I say rogue, but I mean something else. After my first go, the machine whirred and the cogs stopped working. Being a novice at all this industrial lark, I was convinced I'd overloaded it, as I was informed by the seller 'buy with confidence' and 'just been serviced'. Well, thanks AGAIN to my baker friend, he put me in touch with a man who fixes them; £120 later and two vital replacement parts (which were absent in the first place!) I was up and running. So now, I am completely self sufficient and for the last market, which was Hexton, way back in December, I did all my dough from home. 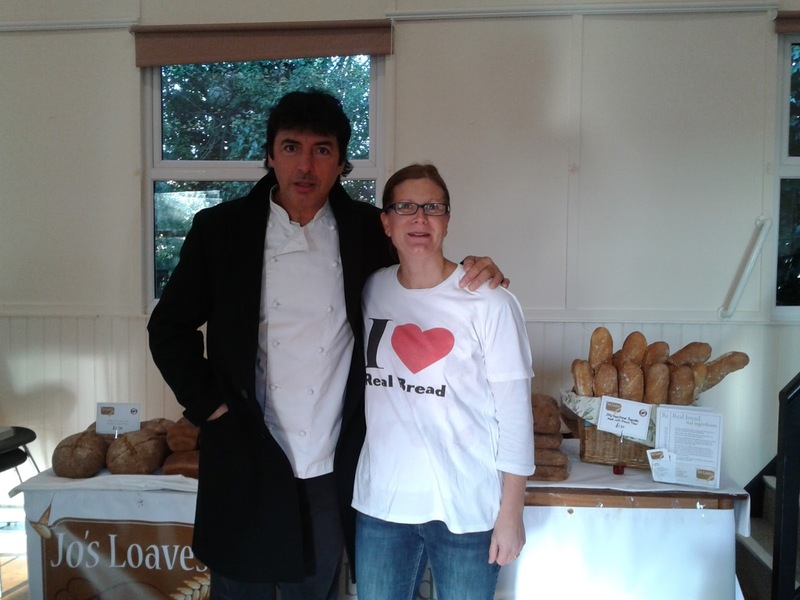 The little bread-orphan in the picture is one of the other great loves of my life, (my long suffering bread-widower husband, being the other). In October or November, I had an an article published in True Loaf - the magazine of choice for all members of the Real Bread Campaign. That's me in the picture, in the days before I got my precious mixer. I have made a few updates on the pages on this site, so DO have a little nosey around if you haven't before and please check out my How To Order page if you are unable to make it to any of the markets. Very excited for the next market, which is Offley again next Friday - hoping it's warmer and the snow's all gone too. I will be flying solo as my mum who usually helps me out on the stall will be in hospital having a new hip, so if anybody out there wants to give me hand, I would be truly grateful (payment in bread only I'm afraid though, but running the stall is, how shall I put this... "Such Fun!"